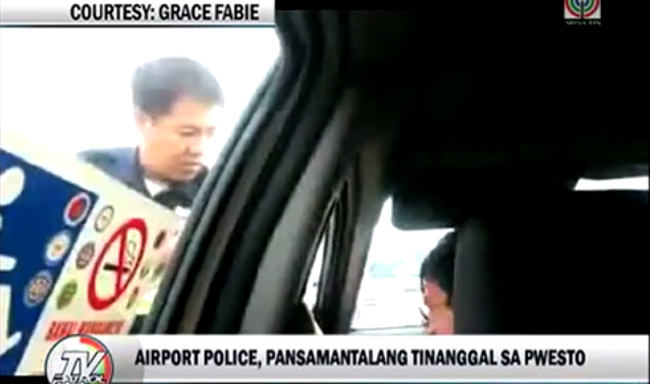 The NAIA police officer in the recent viral photo who broke the glass window of a taxi is now temporarily suspended while the driver received various complaints from the airport police. The viral video on Facebook had shown the NAIA police arguing with the taxi driver who had refused to show his license. The passengers were able to catch the whole incident including when police had crashed the glass window at the driver’s side. The passengers and drivers were surprised. During the exchange of heated words, the police asked the driver if he knew his violation. The driver neither admitted nor denied on making a violation but indeed said that there were other drivers who did the same thing before and got away with it. The driver seemed to challenge the police by saying that he will only give his license if the police will also flag down the other drivers who did the same. Apparently, the driver had picked up his passengers from no loading and unloading area. The arguments heated and the police hit the hood of the taxi before breaking the glass window. The airport police was relieved from his duties while he had filed complaints of resisting arrest and disobeying a person of authority if the fiscal office at Pasay City. Obstruction of traffic and disregarding traffic signs were filed on the LTO Office against the taxi driver.